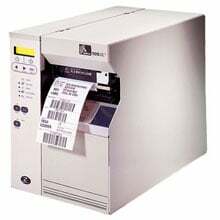 Zebra 105SL - Thermal transfer Industrial Printer (203 dpi, Wi-Fi Ready (Radio Card Not Included), Ethernet, Serial (RS-232), and Parallel interfaces, 4" max print width, 6MB DRAM, 4MB Flash, Rewinder and Peeler). Includes power supply. Cables sold separately. See accessories. Extended Life Printhead for Zebra 105SL, 300 dpi. The Zebra 10500-2001-2400 is also known as ZEB-1050020012400	or 1050020012400	.